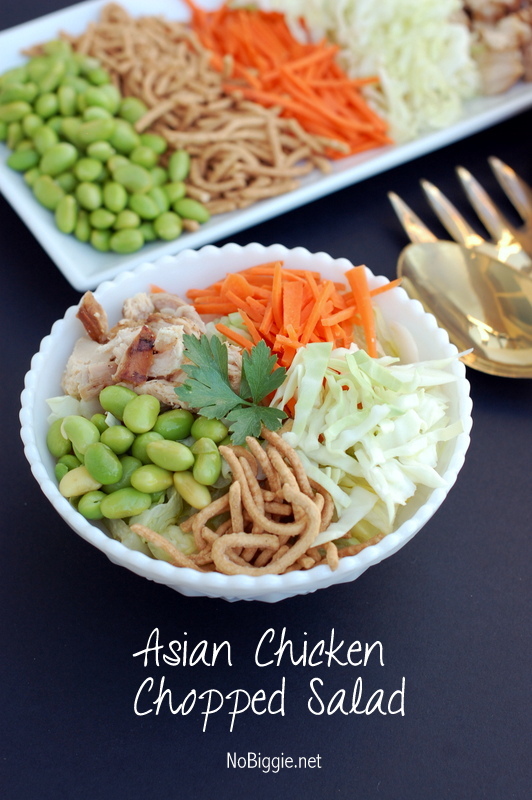 Asian Chicken Chopped Salad is a favorite when eating out and now to make at home! I love a good chopped salad…when everything is already chopped up into bite size pieces and ready to go, it just makes it more fun to eat. Whenever I go to Paradise Bakery I always order their asian chicken chopped salad. It’s fun to be able to make something at home that you love to eat when you’re out. You’ll be surprised at how easy this recipe is to make at home too. The ingredients are simple and since it’s a salad, there’s not much measuring. Just chop, dress, toss and serve. I’ve partnered with Marzetti® using their Simply Dressed® line of refrigerated salad dressing for this recipe. 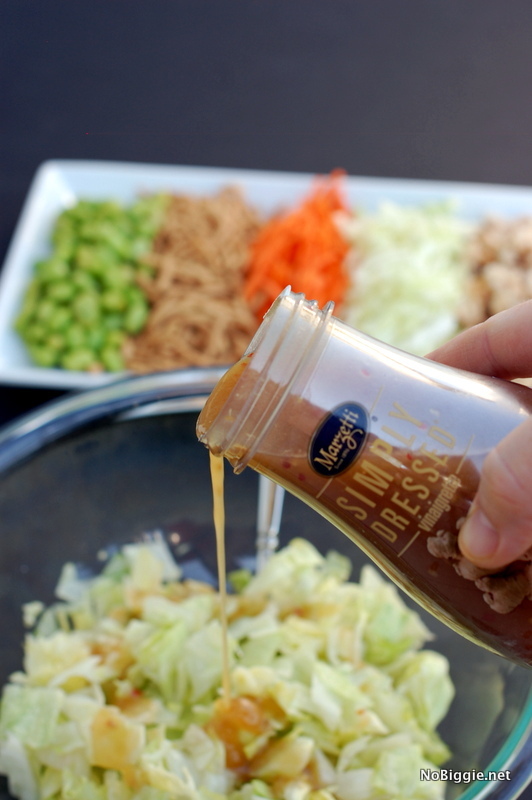 Their Simply Dressed Ginger Sesame dressing is so good with this salad. You can find this dressing with the refrigerated salad dressings in the produce section. For the Utah locals, I bought mine at Smith’s Grocery Store. 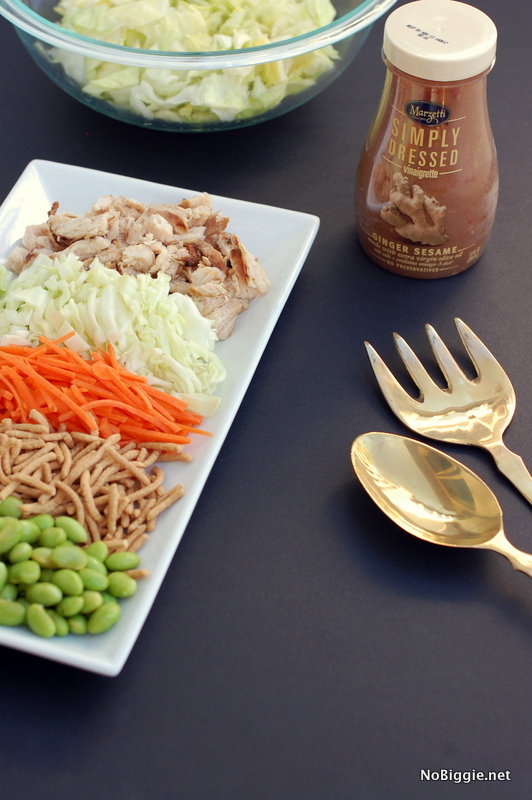 -Just toss the chopped iceberg with the dressing and top it with all the other ingredients. -Serve with additional dressing on the side. 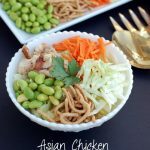 This asian chicken chopped salad is so easy to make at home, and we love how everything is cut into bitesized pieces making it fun to eat. Just toss the chopped iceberg with the dressing and top it with all the other ingredients. We love the presentation of all the ingredients lined up on a platter like the photo above, but you will toss it together right before serving. If you plan to serve this with friends, this would be a fun way to serve it. Next time you are at the store, you’ll have to pick up everything for this salad. It makes a great lunch or a light dinner in the Summer. Disclosure: I’ve been invited to participate in a Marzetti® ambassador program. This post is sponsored by Marzetti and product has been provided by them. The opinions and ideas here are my own. Thanks for helping support the brands that keep me inspired in the kitchen. I love this salad! Going to be making this very soon! Pinned! quick question…..do you marinade your chicken before grilling? thank you!! will you please tell me what you use for marinade? how long to you marinade?